Given the number of couples that return to our Farm to Fork Fondo events year after year, apparently there is a magic formula for nailing couples-ride success. We’ve asked around and compiled this list of tips to help you spend a drama-free day together on bikes. Focus on the experience being together — If you’re the faster partner, remember today is isn’t about your ride but rather the miles you get to spend together. If you’re having a hard time unmarrying cycling and a workout, try instead to remember all of the reasons why you started riding in the first place. Enjoy the landscape presenting itself around you, stop and smell the roses. No, really, smell them! Your partner will probably welcome the brief break. Stay present — It’s easy to get carried away when your partner makes it to the top of the first hill matching your brisk pace. Don’t get carried away. Since you’re used to miles on the saddle, stick to an attainable distance and pace so that your partner is left with energy and excitement to go further next time. It’s a date that happens to be while riding bikes — It’s not a race and it isn’t a workout, but it’s also not watching Netflix on the couch. So, go you! Enjoy it for what it is! Remember what it feels like to be the slow one — We all have someone who rides faster than us. Think about it: how does that make you feel? Speedy gets to the top of the hill, waits for you, and then jets off as soon as you make it to the crest, leaving you no time to catch your breath. When you finally catch up on the downhill, anger or frustration may be quick to burst to the surface. Recall those feelings. That’s a lot of extra emotional energy that may be weighing down your partner today. Rig the pace with a friend — By adding more people it can feel like a party on bikes, and often provides more distraction for the person bringing up the rear. Pack away your ego — Let them lead for a while, back off, touch the breaks, just cruise. Stick to the plan — You might think it’s a good idea to tack on a few extra miles because your partner is doing so well, but don’t forget you still have to get all the way back to your initial starting point. Leave some “gas in the tank” for a celebratory beer, coffee, treat, or other Saturday plans that might be on your calendars. Divide and conquer — Instead of trying to do the whole ride together, how about you go out for a few fast miles to tire yourself out a bit before circling back to rejoin your partner? Best to add the miles beforehand so you can celebrate miles cycled together as you finish. Use your resources — Let technology help with the addition to an e-bike to your cycling family. E-bikes like the Aria E-Road from our partner Bianchi can be a nice equalizer to even out different levels, abilities, and fitness. 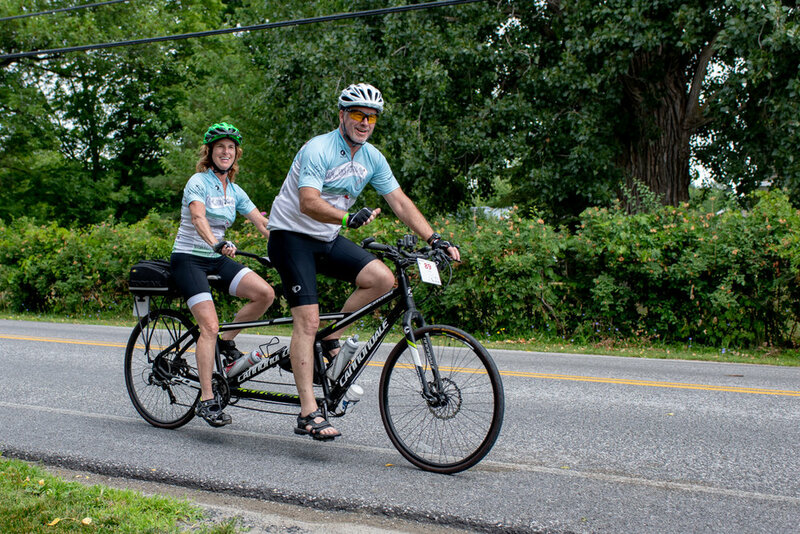 If all else fails, get a tandem — This can help even out partner pace, but requires more patience and communication. It’s a relationship builder, for sure! Remember that each mile you spend together with your partner is one ride closer to them becoming your pace keeper. A Farm to Fork Fondo is a noncompetitive cycling ride that varies in length from a Ramble Ride of 8-12 miles, to a max length Gran Fondo of 75-90 miles. Our rides are beautiful, well-marked, and fully supported with professional course support, dispatch, police support, marshals, and directional signs every mile to keep you on track to a delicious and memorable finish. The energy is contagious, from the gourmet Meet the Farmer Dinner the night prior to the event, to the last beer out of the keg during the post-ride Farm to Fork barbecue. You’ll be well-supported and well-fed. Bring your partner along for a ride this summer and experience a Farm to Fork Fondo together! Because Valentine’s Day is just around the corner we put together a very sweet deal for your and your someone special.